Rory McIlroy and caddie JP Fitzgerald on Thursday. Photo Jenny Matthews/www.golffile.ieRory McIlroy refused to back down in his vigorous defence of his caddie following his Twitter war with pundit Jay Townsend. The Ulsterman told the former pro and TV commentator to “shut up” and branded him a “failed golfer” after getting annoyed by Townsend’s constant criticism of JP Fitzgerald. 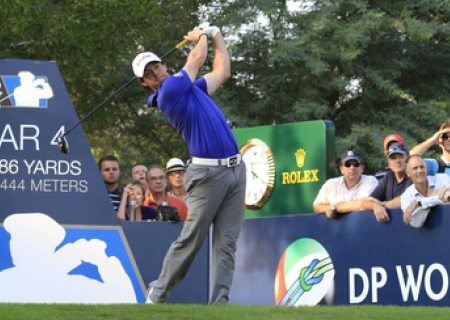 Asked if he regretted getting personal, McIlroy said: “No. Not at all. I know he was on Tour for six years and he finished second in the Heineken Classic or whatever it was. But he doesn’t need to be that opinionated. “I don’t care if he criticises me, because I’m the golfer; I’m the one that hits the shots and I can take the criticism. It’s JP who doesn’t have to do this and can’t stand up for himself in the media. Michael Hoey raced into contention in Killarney by keeping the bogey man at bay. The Ulster star has had just one bogey in 36 holes with rounds of 69 and 67 leaving him just three off the pace on six under. He had an 83 in Sweden last week but he’s delighted with his steady play on home turf. He said: “Only one bogey in 36 holes. I played well today, hit it well and hit a lot of fairways. Cheered on by a massive 20,215 crowd, he said: “The crowds make it a really good atmosphere and it helped me last year and definitely helped today, getting into a bit of a zone out there. Colm Moriarty has his eye on a top-three finish that could secure his European Tour card eight years after turning professional. The Glasson pro, 32, hit a 72 to sit just six off the lead on three under knowing that a big pay day to help him escape the Challenge Tour. Moriarty said: “A top-10 isn’t going to be a huge benefit to me. I need to concentrate on the Challenge Tour and get in through that way. Moriarty is 215th in the money list with €23,780 thanks to a handful of European Tour starts. But with second place worth €166,660 and third paying €93,900 he could earn enough to finish in the top 115 who get cards at the end of the season. Warrenpoint’s Barrie Trainor was disqualified for signing for an incorrect score. The former Irish Assistants champion followed an opening 70 with a 75 to miss the cut on three over par only to discover after he left the scorer’s tent that he’d signed for a four instead of a five at the 11th. Darren Clarke found out this week that there are major advantages to winning the Claret Jug. Sources in the know say the Open champion avoided a speeding ticket as he burnt rubber in his €200,000 Ferrari 612 Scaglietti on the 300 mile trip from Belfast to Killarney on Monday. Rory McIlroy and caddie JP Fitzgerald. (Photo Jenny Matthews/www.golffile.ie)Rory McIlroy produced one of the shots of the day in Killarney - then shot himself in the foot in a blazing Twitter row that puts an unwelcome spotlight back on his caddie. Rory McIlroy is confident about his equipment change and believes he will be fine once he has spent six weeks testing and gets the new ball “dialled in.” Photo Jenny Matthews/www.golffile.ieRory McIlroy again insisted he had no worries at all about his imminent equipment change after overcoming a sluggish start to open with a bogey free 66 and trail leader Luke Donald by just one stroke in the DP World Tour Championship in Dubai.